We manufacture air cooled connectors, braided copper tapes, round standard copper cables, earthing tapes & ropes. These highly flexible connectors are manufactured by using copper wire of any diameter as per requirement. 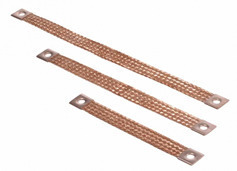 The above copper connectors are made from bare, tined and silver plated copper. The contact areas are assembled with pressed copper connectors, bare and on request tin or silver coated. Hot tinned dipped ends can also be provided to give perfect conductivity. We manufacture connectors in any width and cross section upto 10000 sq. mm. The high flexibility offers installation into difficult and small places. Flexible connectors are individually designed and manufactured keeping in view the user's requirement and application. An ISO 9001:2008 Certified, CRISIL Rated & MSME Regd Co, Anupam eAei was established by Shri SR Modani, he started in 1960 with Shree Shamlaji Industries. During 1971 started business under Anupam & in year 1996 coverted into Pvt Ltd Co.
Today, is a leading manufacturers, suppliers & exporters of wide range of Copper Flats, Winding Wire, Silver & Copper Contact, Flexibles, Jumpers, PG Clamps, Connectors & Conductors. Manufacturers of Cable Trays, Cable Accessories, Structures, Supports, Raceways & Trunkings. Special Metals & Alloys, Authorized Dealer, Distributors & Suppliers of Universal Cables, Khatau Capacitors, Cable Corporation of India, Gloster Cables, NGEF, Cromton Greaves, CGL, Havells, REMI, Bharat Heavy Electrical BHEL, ABB, GEC, AEI, Alstom, Marathon Electric Motors, L&T, Siemens, Kirloskar Electrical Co, Integrated Electric Co, Radio Energy, GE, Hubners, Jayashree, Ador Powertron, Adroit, Indiana Grating, Tachomatric, Excella, Xla, Baumer, Hubner, Tata Blue scope Steel, Safintra Roofing, D&H Secheron Electrodes Pvt Ltd, Esab, Wearresist Technologies. WE can supply Any India & International Makes Complete Equipments, Accessories & Spare-Parts. Our specialty Any Tailor made Items. WE work on Principle of Quality & Economy Both At A Time. Main manufacturing at Mumbai & Expansions at Hyderabad with sales offices around India.